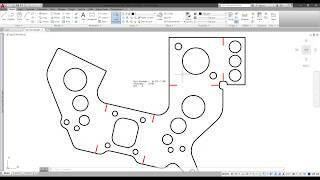 Export sheet metal Flat Pattern parts of an assembly to DXF in one go. Besides just exporting the Flat Patterns, the application will also insert Part Number, Material, Thickness and Quantity properties for each Flat Pattern DXF file or include it in the file name. It greatly improves efficiency and saves time and avoids having to do manual processing work down the line. It eliminates any errors creeping in while manually entering and specifying cutting processes. Options are provided to simplify the exported geometry to make the file readable in any CNC software removing duplicate or double lines wherever possible. All profiles are re-aligned to the positive quadrant and can be configured to only contain Cut lines. No clean-up is required after the export. - DXF Exporter icon will be available on your Desktop. - Autodesk® Inventor® must also be running for the app to work. - The app is available as a Full Featured Product for a 15 day period after which Free Mode is enabled with limited functionality. Exports STEP files, Really like the Bend line edge marks at contour . Helping the guys on the floor . Great customer service. Thanks for the kind words Doug! Great tool, creating DXFs is noramlly a headache but this is easy to use and saves me a ton of time. recommended. Works great, time saving, top service. What functionality is limited with the Free version? Hi Stephen, Thanks for your question but I am not sure why you have rated the app with only one start when asking a question? Would you consider changing that? Anyway, the free version has many limitations which you would see after 15 days. Things like: Layer settings and colors customization restrictions Export filename restrictions Spline simplification restrictions Limit number of parts that can be exported to 20 You are welcome to email me if you need any further help or if you have any suggestions. I don't use DXF data that much but it's cool to have it being free. Thank you very much. How can I purchase the full edition??? The app works great!! but I am concerned about the note: "The app is available as a Full Featured Product for a 15 day period after which Free Mode is enabled with limited functionality." I want to keep full functionality. How can I purchase the full edition? This is the correct link: "http://www.mgfx.co.za/buy-tools-for-inventor.htm" James the one you listed did not link properly and points to a page link without the .htm at the end which obviously does not work. Instead of just clicking the link please copy and paste the whole link into your web browser to ensure it works. Overall the software is great. Clean and intuitive interface, lots of features, and integration with Inventor. What I couldn't find is the option to merge dxfs into one file, and ability to change export units. Merging the dxfs would be great option for weldments, when single part consist of multiple sub-components. Changing units is great option, if you design parts in both metric and imperial, but you would like to keep exported dxfs consistent. Also, metric parts cut on US stock materials would show the thickness in inches. Currently I'm using custom macro that can export single parts dxfs from inventor. It is not as advanced as this batch conversion tool, but it meets my needs. I was hoping this tool would be able to merge dxfs for weldments, but maybe on the next update. Keep up the good work! great tool, works fantastic, saves lots of time. Nothing did disappear as told above. Exporting colors in the layer would be great if included. Hi Peter, as mentioned below the entities are exported per layer as I think you mentioned. We have done it like that purposefully so that each person can set their own colors. We will investigate adding a color feature inside the app. Where did the flat pattern go??????? Great tool but would be better if you could set the feature colors on export so you dont need to rework the DXF. Also my flat patterns in the model go bye bye after exporting, BIG BUMMER!!!!!!! Will not purchase because of this. *******UPDATE****** Since my original post I have actually gone ahead and purchased this tool because it is very useful and perfect for my application. The customer service was beyond expectation and was a big factor in my decision to purchase. Great work on this app and I look forward to using it daily.